Every person in a local church is vital to the mission and vision of the church. This means you… yes YOU, are vital to the mission and vision of Christ Community. Many of you who read this email weekly are committed members who serve faithfully, give regularly, and worship weekly with us. Others of you are not members, are loosely engaged, and don’t spend much time thinking about your church involvement. If you fall into the last category, I pray that you would consider joining with us, reengaging with us, or committing to take whatever next step of involvement looks like for you. Here’s a few ways you can do that! Did you know that you were made with gifts? God gave you a gift that is meant to be used to serve the local church! We want you to discover your gift and deploy it in one of the many ministries in Christ Community! 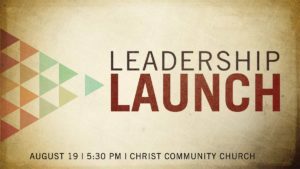 Leadership Launch is our leadership rally for all current volunteers and all of those who have interest in serving at Christ Community. Whether you know your gift or not, serve already or don’t, whatever the case, we want you to be engaged with us in leadership at Christ Community. You do not have to be a member or a current volunteer to attend Leadership Launch. We will provide dinner and childcare, we’ll have some fun together, and I will be sharing from my heart on a few important topics relating to my own personal focus for this next year. It will be a blast! You can follow this link to register. Fall Kick-Off Sunday is one of those “all hands on deck” Sundays. We want everyone here on this day as I share about a vital new ministry shift we’re making that will help us to better accomplish our mission of making gospel-centered disciples among all people for the glory of God. 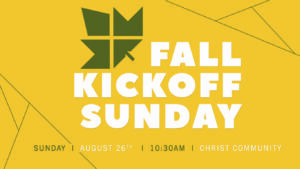 Rally your small group, your ministry volunteers, and your neighbors, and join together for this exciting Fall Kick-Off Sunday! Following our worship service, we’ll enjoy food and fun for everyone outside! We’ll have bouncies, games, and other great opportunities to connect with others. Lunch will be provided, so mark it on your calendars! Physically… Be present with us this year. Commit to regularly gathering with your church family. I believe it’s really important for you be faithfully engaged as a member in our church. You need the church and the church needs you. This past Sunday, I preached on the importance of gathering weekly with your church family in corporate worship. If you missed it I hope you’ll take a minute to follow this link and watch it yourself. I pray God uses it to stretch your thinking on what it means to be faithfully engaged in the Church. Financially… I often spend time in this email calling all of us into radical sacrificial giving through the local church because I know the pull on each of our hearts from the world regarding money. I do so unapologetically because I believe it’s vital that we fund the ministry God has given us and to do so faithfully! God has been faithful to provide for our ministry budget needs this year as well as our Summer Giving Challenge. With only three weeks remaining, I want us to finish strong! These next two Sundays are vital due to our September 2 being Labor Day, so plan accordingly! Help your church finish strong by being obedient to God through generous sacrificial giving. Remember, you cannot out-give God! Follow this link if you’d like to give today. Pray for God to bring a Spiritual Awakening to Christ Community. Only God can do this! Let’s pray for it! Pray for our members and regular attenders to engage beyond what they have been engaged. Pray for our ministry team and pastors as we seek to lead Christ Community faithfully. What we get to do at this moment in history is a gift from God. As we lead out this year, let’s be a godly example of what a true follower of Jesus should be. Lets love others well, engage in the Church Jesus died for, and let’s paint a good picture of what a Christian is. I love you Christ Community and I consider it a great blessing to be your pastor. I’m praying with you for greater days than we’ve ever experienced. Those days come when we engage together weekly. I can’t wait to do just that with you this Sunday! I’ll see you there.